A recent report published by Infinium Global Research on image-guided therapy systems market provides an in-depth analysis of segments and sub-segments in the global as well as regional image-guided therapy systems market. The report is a comprehensive presentation of trends, forecast and dollar values of global image-guided therapy systems market. According to the report, the global image-guided therapy systems market is projected to grow at a CAGR of 6.8% over the forecast period of 2018-2024. A recent report published by Infinium Global Research on pigmentation disorders treatment market provides an in-depth analysis of segments and sub-segments in the global as well as regional pigmentation disorders treatment market. The report is a comprehensive presentation of trends, forecast and dollar values of global pigmentation disorders treatment market. According to the report, the global pigmentation disorders treatment market is projected to grow at a CAGR of 5.9% over the forecast period of 2018-2024. A recent report published by Infinium Global Research on syringes market provides in-depth analysis of segments and sub-segments in the global as well as regional syringes market. The report is a comprehensive presentation of trends, forecast and dollar values of global syringes market. According to the report, the global syringes market is projected to grow at a CAGR of 8.9% over the forecast period of 2018-2024. A recent report published by Infinium Global Research on next-generation sequencing (NGS) market provides an in-depth analysis of segments and sub-segments in the global as well as regional next-generation sequencing (NGS) market. The report is a comprehensive presentation of trends, forecast and dollar values of global next-generation sequencing (NGS) market. According to the report, the global next-generation sequencing (NGS) market is projected to grow at a CAGR of 18.6% over the forecast period of 2018-2024. A recent report published by Infinium Global Research on blood glucose test strips market provides an in-depth analysis of segments and sub-segments in the global as well as regional blood glucose test strips market. The report is a comprehensive presentation of trends, forecast and dollar values of global blood glucose test strips market. According to the report, the global blood glucose test strips market is projected to grow at a CAGR of 4.1% over the forecast period of 2018-2024. A recent report published by Infinium Global Research on breast cancer liquid biopsy market provides an in-depth analysis of segments and sub-segments in the global as well as regional breast cancer liquid biopsy market. The report is a comprehensive presentation of trends, forecast and dollar values of global breast cancer liquid biopsy market. 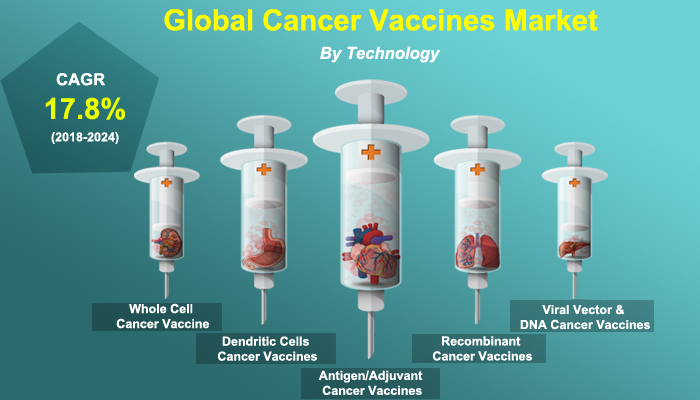 According to the report, the global breast cancer liquid biopsy market is projected to grow at a CAGR of 20.9% over the forecast period of 2018-2024. A recent report published by Infinium Global Research on disabled and elderly assistive technology market provides an in-depth analysis of segments and sub-segments in the global as well as regional disabled and elderly assistive technology market. The report is a comprehensive presentation of trends, forecast and dollar values of the global disabled and elderly assistive technology market. According to the report, the global disabled and elderly assistive technology market is projected to grow at a CAGR of 6.9% over the forecast period of 2018-2024. A recent report published by Infinium Global Research on plasma protein therapeutics market provides in-depth analysis of segments and sub-segments in the global as well as regional plasma protein therapeutics market. The report is a comprehensive presentation of trends, forecast and dollar values of global plasma protein therapeutics market. According to the report, the global plasma protein therapeutics market is projected to grow at a CAGR of 6.1% over the forecast period of 2018-2024. A recent report published by Infinium Global Research on artificial intelligence in diabetes management market provides in-depth analysis of segments and sub-segments in the global as well as regional artificial intelligence in diabetes management market. The report is a comprehensive presentation of trends, forecast and dollar values of global artificial intelligence in diabetes management market. According to the report, the global artificial intelligence in diabetes management market is projected to grow at a CAGR of 47.55% over the forecast period of 2018-2024. A recent report published by Infinium Global Research on tissue expander market provides an in-depth analysis of segments and sub-segments in the global as well as regional tissue expander market. The report is a comprehensive presentation of trends, forecast and dollar values of global tissue expander market. According to the report, the global tissue expander market is projected to grow at a healthy CAGR over the forecast period of 2018-2024. A recent report published by Infinium Global Research on thrombosis drug market provides in-depth analysis of segments and sub-segments in the global as well as regional thrombosis drug market. 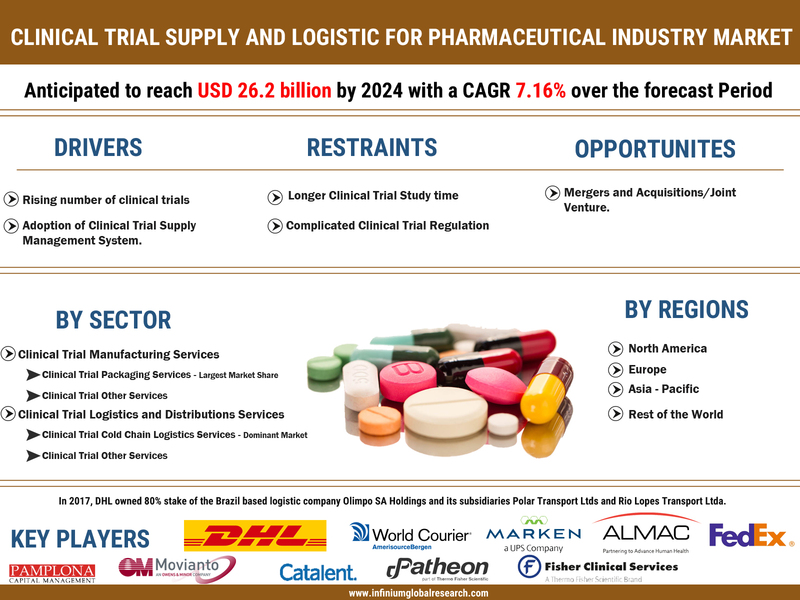 The report is a comprehensive presentation of trends, forecast and dollar values of the global thrombosis drug market. According to the report, the global thrombosis drug market is projected to grow at a CAGR of 9.1% over the forecast period of 2018-2024. A recent report published by Infinium Global Research on oral proteins and peptides market provides in-depth analysis of segments and sub-segments in the global as well as regional oral proteins and peptides market. The report is a comprehensive presentation of trends, forecast and dollar values of global oral proteins and peptides market. According to the report, the global oral proteins and peptides market is projected to grow at a CAGR of 12.6% over the forecast period of 2018-2024. A recent report published by Infinium Global Research on laboratory equipment services market provides in-depth analysis of segments and sub-segments in the global as well as regional laboratory equipment services market. The report is a comprehensive presentation of trends, forecast and dollar values of global laboratory equipment services market. According to the report, the global laboratory equipment services market is projected to grow at a CAGR of 9.55% over the forecast period of 2018-2024. A recent report published by Infinium Global Research on blood transfusion diagnostics market provides in-depth analysis of segments and sub-segments in the global as well as regional blood transfusion diagnostics market. The report is a comprehensive presentation of trends, forecast and dollar values of global blood transfusion diagnostics market. According to the report, the global blood transfusion diagnostics market is projected to grow at a CAGR of 6.70% over the forecast period of 2018-2024. A recent report published by Infinium Global Research on physiotherapy devices market provides in-depth analysis of segments and sub-segments in the global as well as regional physiotherapy devices market. The report is a comprehensive presentation of trends, forecast and dollar values of the global physiotherapy devices market. According to the report, the global physiotherapy devices market is projected to grow at a CAGR of 6.40% over the forecast period of 2018-2024. A recent report published by Infinium Global Research on scleroderma diagnostics and therapeutics market provides in-depth analysis of segments and sub-segments in the global as well as regional scleroderma diagnostics and therapeutics market. The report is a comprehensive presentation of trends, forecast and dollar values of global scleroderma diagnostics and therapeutics market. According to the report, the global scleroderma diagnostics and therapeutics market is projected to grow at a CAGR of 9.8% over the forecast period of 2018-2024. A recent report published by Infinium Global Research on blockchain technology in the healthcare market provides an in-depth analysis of segments and sub-segments in the global as well as regional blockchain technology in the healthcare market. The report is a comprehensive presentation of trends, forecast and dollar values of global blockchain technology in the healthcare market. According to the report, the global blockchain technology in the healthcare market is projected to grow at a CAGR of 69.70% over the forecast period of 2018-2024. A recent report published by Infinium Global Research on albumin market provides in-depth analysis of segments and sub-segments in the global as well as regional albumin market. The report is a comprehensive presentation of trends, forecast and dollar values of global albumin market. According to the report, the global albumin market is projected to grow at a CAGR of 6.8% over the forecast period of 2018-2024. A recent report published by Infinium Global Research on vibrating mesh nebulizer market provides in-depth analysis of segments and sub-segments in the global as well as regional vibrating mesh nebulizer market. The report is a comprehensive presentation of trends, forecast and dollar values of global vibrating mesh nebulizer market. According to the report, the global vibrating mesh nebulizer market is projected to grow at a CAGR of 7.6% over the forecast period of 2018-2024. A recent report published by Infinium Global Research on pharmaceutical intermediates market provides in-depth analysis of segments and sub-segments in the global as well as regional pharmaceutical intermediates market. The report is a comprehensive presentation of trends, forecast and dollar values of global pharmaceutical intermediates market. According to the report, the global pharmaceutical intermediates market is projected to grow at a CAGR of 4.20% over the forecast period of 2018-2024. A recent report published by Infinium Global Research on heart pump device market provides in-depth analysis of segments and sub-segments in the global as well as regional heart pump device market. The report is a comprehensive presentation of trends, forecast and dollar values of global heart pump device market. According to the report, the global heart pump device market is projected to grow at a CAGR of 18.5% over the forecast period of 2018-2024. A recent report published by Infinium Global Research on injection pen market provides an in-depth analysis of segments and sub-segments in the global as well as regional injection pen market. The report is a comprehensive presentation of trends, forecast and dollar values of the global injection pen market. 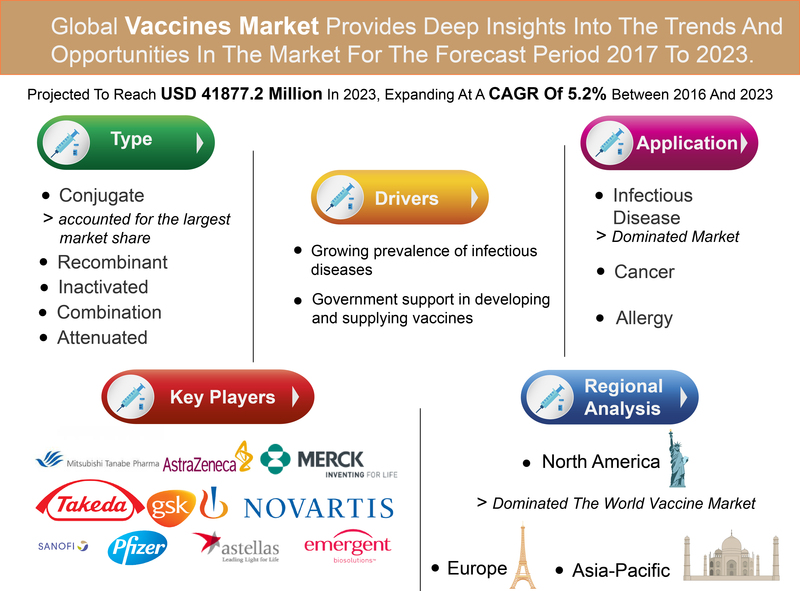 According to the report, the global injection pen market is projected to grow at a CAGR of 6.3% over the forecast period of 2018-2024. A recent report published by Infinium Global Research on safety syringes market provides an in-depth analysis of segments and sub-segments in the global as well as regional safety syringes market. The report is a comprehensive presentation of trends, forecast and dollar values of global safety syringes market. According to the report, the global safety syringes market is projected to grow at a CAGR of 8.9% over the forecast period of 2018-2024. A recent report published by Infinium Global Research on nerve monitoring system market provides an in-depth analysis of segments and sub-segments in the global as well as regional nerve monitoring system market. The report is a comprehensive presentation of trends, forecast and dollar values of global nerve monitoring system market. According to the report, the global nerve monitoring system market is projected to grow at a CAGR of 6.7% over the forecast period of 2018-2024. A recent report published by Infinium Global Research on pain management therapeutics market provides in-depth analysis of segments and sub-segments in the global as well as regional pain management therapeutics market. The report is a comprehensive presentation of trends, forecast and dollar values of global pain management therapeutics market. According to the report, the global pain management therapeutics market is projected to grow at a CAGR of 4.5% over the forecast period of 2018-2024. A recent report published by Infinium Global Research on real world evidence solutions market provides in-depth analysis of segments and sub-segments in the global as well as regional real world evidence solutions market. The report is a comprehensive presentation of trends, forecast and dollar values of global real world evidence solutions market. According to the report, the global real world evidence solutions market is projected to grow at a CAGR of 14.6% over the forecast period of 2018-2024. A recent report published by Infinium Global Research on precision medicine market provides in-depth analysis of segments and sub-segments in the global as well as regional precision medicine market. The report is a comprehensive presentation of trends, forecast and dollar values of global precision medicine market. According to the report, the global precision medicine market is projected to grow at a CAGR of 8.86% over the forecast period of 2018-2024. A recent report published by Infinium Global Research on RFID in healthcare market provides in-depth analysis of segments and sub-segments in the global as well as regional RFID in the healthcare market. 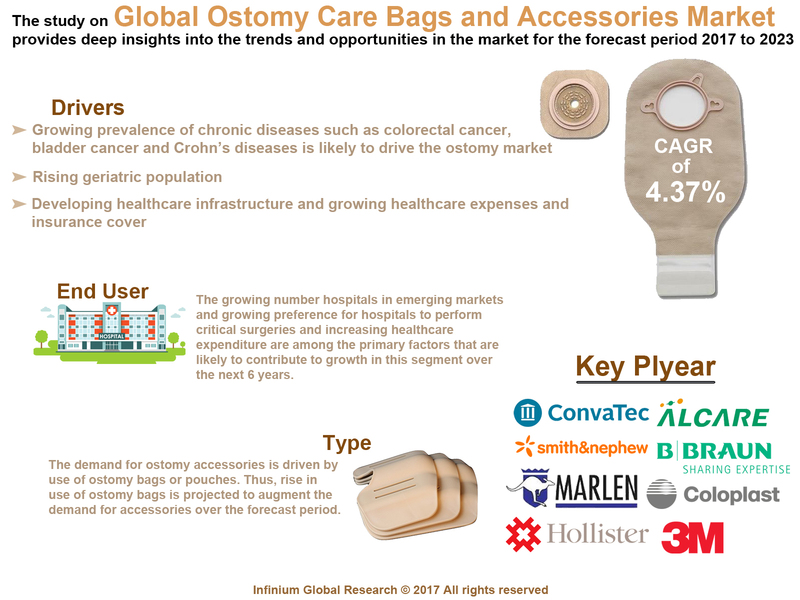 The report is a comprehensive presentation of trends, forecast and dollar values of global RFID in the healthcare market. According to the report, the global RFID in the healthcare market is projected to grow at a CAGR of 13.5% over the forecast period of 2018-2024. 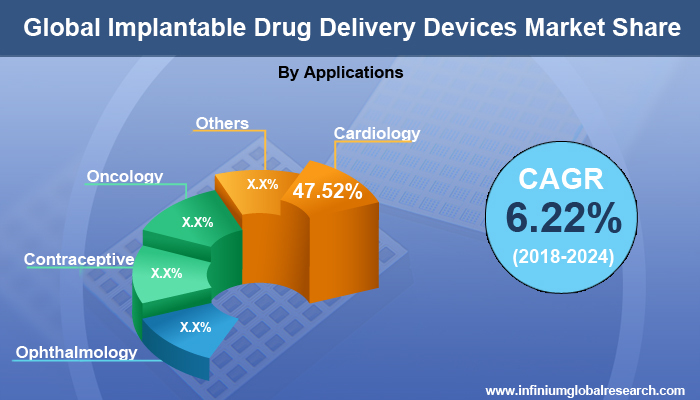 A recent report published by Infinium Global Research on active implantable medical devices market provides an in-depth analysis of segments and sub-segments in the global as well as regional active implantable medical devices market. The report is a comprehensive presentation of trends, forecast and dollar values of global active implantable medical devices market. According to the report, the global active implantable medical devices market is projected to grow at a CAGR of 4.6% over the forecast period of 2018-2024.